Interim dean Fred Kniss has been spending his commute time to Eastern Mennonite Seminary listening to his “much too large” CD collection rather than tuning in to the morning and evening news on NPR, lately filled with civil division, violence and tragedy. A self-proclaimed “longtime politics and news junkie,” Kniss says listening to music with new meditative focus is, for him, a form of spiritual discipline. A seminary convocation audience member sets down his paper inscribed with the hopes for the coming year with others. So it happened that Willie Nelson’s rendition of the old gospel song “Whispering Hope” provided the background music for a collective exercise in “hope-building” among the nearly 60 people in attendance at the seminary’s fall convocation. Inscribing on small slips of paper their hopes that are both anchoring and calling to action, those present contributed to what will become a collective art project in the weeks to come. Convocation, an annual event marking the beginning of each new academic year, invites the seminary community to join in greeting, worship, sharing and blessing. 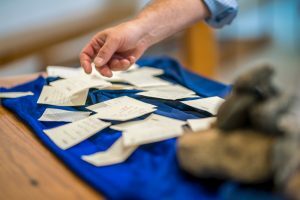 Students, returning students, faculty, staff and guests were each recognized at the beginning of the service as vital contributors to the community’s spiritual journey. “We are here to companion one another to discover and name hope,” the litany concluded. 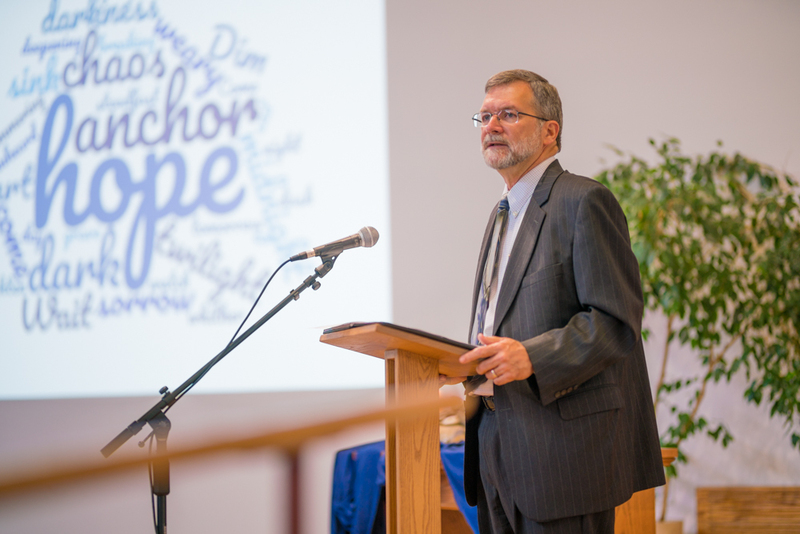 Asked to bring the first meditation on the theme of hope that will be explored by other seminary faculty and staff throughout the academic year, Kniss delved into biblical texts and hymn lyrics to provide a deconstruction of his own definition of hope. Hope is not always, or only, action toward change, he said. In his exegesis, Kniss moved toward the conclusion that “quiet, persistent, steadfast hope,” made possible with the gracious receiving and generous sharing of God’s love, can provide an anchor, an “unchanging rootedness,” to couple with the active pursuit of change. “The ‘whisper’ of hope and the noise of action, the internal anchor and the external engagement are two sides of the same coin,” he said. Turning towards the role of the seminary in enacting, encouraging and inspiring hope, Kniss points to its founding theological framework and to the strengths of deeply rooted Anabaptist identity and tradition, as well as engagement with the world. The Bible as the main source of our knowledge of God, Jesus, and being the inspired Word of God is the main source of our HOPE. According to Issaiah, the Inspiration of Scripture (including history, pre-history, and prophecy, both fulfilled and future !) is our only hope. I don’t need to know the original languages since thousands of good scholars have done that for me but I have found great HOPE in reading through the Bible in as many translations as possible, benefitting by the variations that give me the gist of the original meaning .